My Tattoo Scab is Bleeding – What Should I Do? For the most part, a healing tattoo with a light layer of scabbing over it is completely normal. When you get a tattoo you are essentially causing large amounts of trauma to a specific area of skin thanks to the multiple needles puncturing your skin thousands of times in a single sitting. This tattooed area is essentially an open wound, and the only way for your body to close a wound in order to regenerate the skin and to prevent infection occurring is to scab the area over while the skin below proceeds to repair itself. This scabbing process starts when a component within your blood called plasma starts to ooze out of the wound and begins to harden, covering the open area – your white blood cells will then begin to work in and around the scabbed area to fight off any nasty’s that try to break through as your skin proceeds to regenerate and repair. In one way or another, yes, they do. You might only normally picture scabs as being thick, scaly lumps of pus and blood-filled skin, but this is not the case. Usually, if you’ve had a good tattoo artist, your skin should form a very small layer of scabbing skin all over your tattoo. 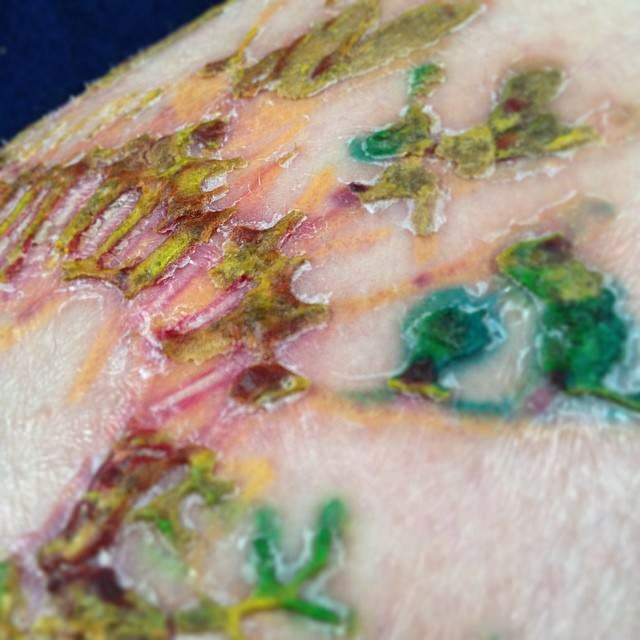 This scabbed skin will be slightly raised compared to other areas and will likely look cloudy and dull – this is what most normal scabbing looks like on a tattoo. I’m sure you’re wondering if the commonly-seen thick, dark, crusty scabs are normal on a tattoo too – and yes they are. These heavy unsightly scabs usually appear in areas where the artist has had to go over the same area multiple times, this is usually to add dark shading to certain parts of your tattoo. Scabs are also more prone to forming over your tattoo if the tattoo is particularly large or detailed as the longer a tattooing session goes on, the more trauma that is caused to your skin and the more likely it is for certain areas to form a thicker scab compared to the rest of the tattoo. On the other hand, if mostly all of your tattoo is covered or scattered with thick dense scabs, then this may not be an ‘average’ scabbing situation. Sometimes tattoos can scab heavier than others for reasons such as the artist being too rough, causing unwanted dryness and cracking as the tattoo heals. If the artist is heavy-handed or inexperienced then it’s possible they are pressing the needle down too firmly into your skin, protruding more layers and causing more trauma than necessary. If this is the case, it may be best to speak about your concerns with your artist or studio owner. As well as a heavy-handed artist, another reason that could lead to thick scabbing is the onset of an infection. Infections are relatively rare in tattoos as long as correct studio hygiene procedures are undertaken, but they do happen. Tattoo infections can cause a whole host of various unsightly symptoms (including thick scabbing) depending on the type of bacteria, so if you are at all concerned that you may have an infected tattoo, get in touch with a doctor a soon as possible. As already stated, tattoo infections are rare, and scabbing alone is normally not a sign of infection. If you have some heavy scabbing but no other symptoms, then try waiting for a few days to see if the scabbing reduces/subsides at all. It’s still advisable though to see a doctor as soon as possible if your scabs are accompanied with severe swelling, bruising, redness or pain. 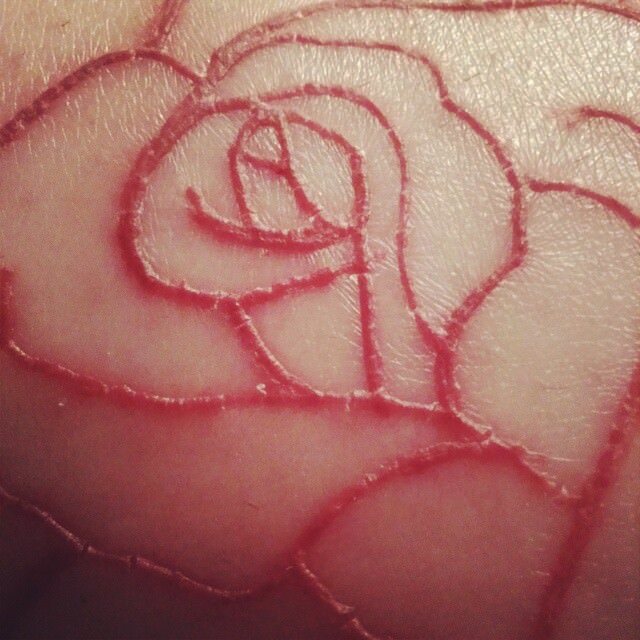 Generally, your new tattoo will begin to form scabs at around the 3-day mark. For the first few days the tattooed area of skin will be oozing plasma in preparation for the scabbing – after these first few days your scabs will start to harden and set over the wounded skin. The scabs will remain until the healing process has completed and the top layer of skin as closed up. At the point, the scabs along with the rest of the upper layer will begin to peel and flake away. This peeling and flaking stage begins at around the 7-day point, and all but the thickest of scabs should have fallen off by the 10-day mark. You must keep in mind though, if you do have any dense, thick scabs that have formed over your tattoo, the general rule of thumb is that the thicker the scab, the longer it is going to take to heal – so be patient if this is the case with your specific tattoo. There are some very important rules that everybody should adhere to when it comes to a scabbing tattoo during the healing process. Failure to stick to these rules can lead to a number of problems including, an increase in healing times, a loss of ink from your tattoo, and infection. 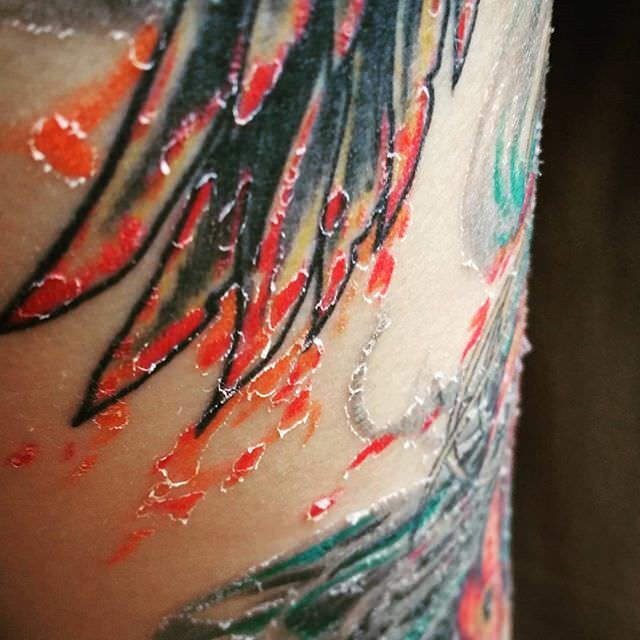 Pick at your Scabs - This is the NUMBER ONE RULE when it comes to your tattoo aftercare. 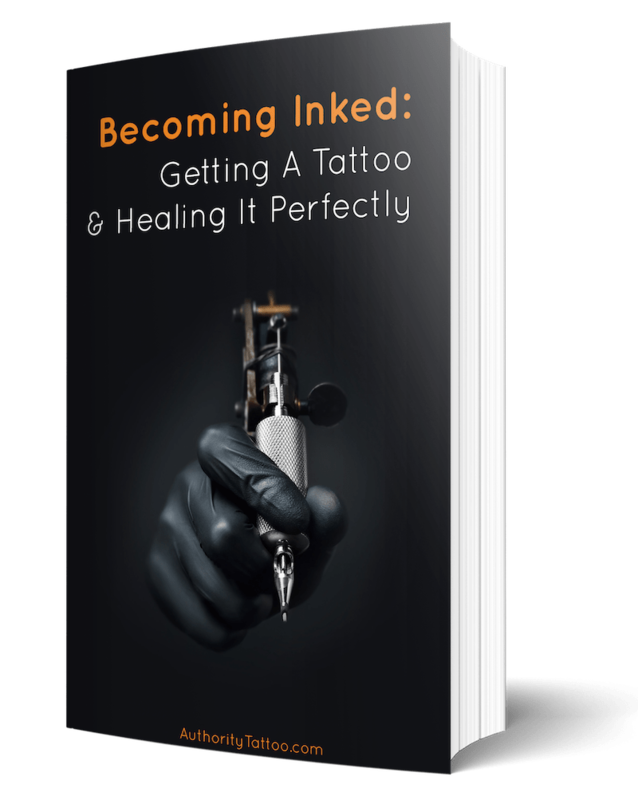 No-matter how big, how small, how dark or how ugly your scabs are – if you begin to pick them off, you greatly increase your chances of pulling ink out of your tattoo along with the scab. It takes a while for the ink to set into the lower layers of skin, and while you are still healing you will have plenty of ink still sitting in the upper layers, and any of this ink can easily be pulled out when a scab comes off, leading to a patchy looking tattoo that will take longer to heal and will probably require a touch-up from your artist. If a scab is still set relatively deep into your skin, pulling it out can lead to pitting and scarring in your skin, greatly increasing healing times and potentially permanently damaging the area. Scratch your Tattoo - This is just as bad as picking and pulling at your scabs. Scratching can actually cause more damage in some situations. Obviously when you pick at a scab, you are only pulling one off, but when you start to scratch at a tattoo, you can cause a lot more damage by pulling off many more scabs in one movement. Not only this, but your fingernails are home to a whole host of infections causing bacteria that would love nothing more than to find a way into your now-scab-less wound. If your tattoo itches and you're struggling to resist the urge to scratch it, take a look at our guide on how to stop your tattoo from itching. Smother your Tattoo in Lotion - Although you should absolutely apply lotion to a new tattoo in order to keep it nourished and hydrated, you never want to apply too much. What happens when you smother a tattoo with a thick layer of lotion is that any moisture trapped between the lotion and the skin will get soaked up by your scabs, making them soggy and gooey - this is known as tattoo bubbling. When your scabs have turned to this oozy consistency it will be much easier for them to get stuck to clothing and other materials and get ripped off. See a detailed review of my favorite tattoo lotions and ointments here. Submerge your Healing Tattoo in Water - Same as above – the scabs will soak up the water, turning them sticky and gooey. Not only this, but remember that most bodies of water contain large amounts of varying forms of bacteria. It’s always advisable to keep out of any bodies of water apart from showers for about a month after getting a new tattoo to help prevent infection. After your tattooist has completed your tattoo and is happy with it, he will clean the area with antiseptic soap and proceed to wrap it with a plastic film or surgical cloth. 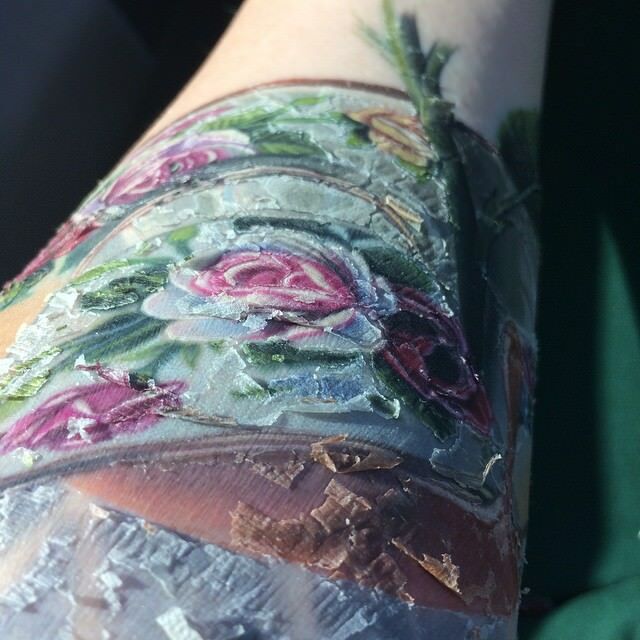 When you come round to taking this wrap off (which will be whenever your artist tells you to take it off), you will likely find that your tattoo is covered in leaky ink, blood, and plasma. 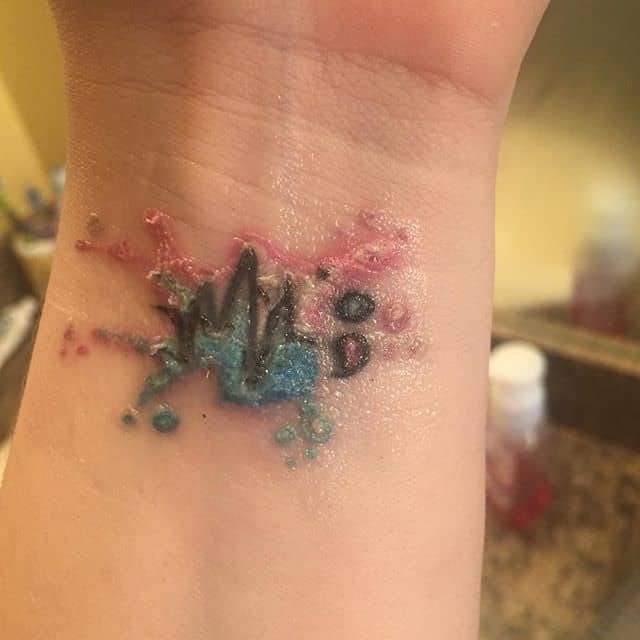 This is completely normal and the oozing will proceed to happen for the next couple of days – but it is the clear runny plasma leaking out of your tattoo that you should be alert for. Thus clear fluid is the initial building block in the scab forming process, and therefore any thick covering of plasma is going to lead to a big thick scab forming over the area. Therefore, what you can do to minimize the risk of big fat scabs forming is to gently wash the area with lukewarm (mild) soapy water to try and get off as much plasma as possible. 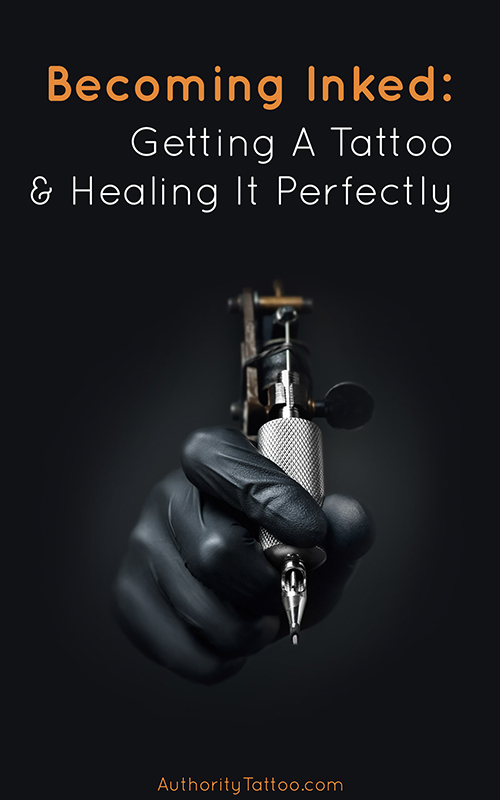 You can find out how to correctly wash your brand new tattoo in our huge tattoo aftercare bible. You should continue to wash your tattoo 2-3 times a day to wipe off any excess oozing to help fight infection-causing bacteria. For the first several days while cleaning your tattoo, you will likely see some excess ink leaking out from your skin and showing up on the paper towel you use to pat dry your tattoo. As long as you’re being gentle to the area and only washing the tattoo with soapy water using your fingers, and only cleaning the tattoo by patting it with a paper towel and not rubbing it, this excess ink should be completely normal and nothing to worry about. Another thing to look watch out for is your scabs sticking to your bed sheets at night. Most of the time this cannot be helped, but if you happen to wake up one morning stuck to the sheets (we’re still talking about tattoos here you dirty people) then DO NOT just pull at the sheets to unstick them. This will pull of the scabs and could cause loss of ink and scarring. Instead, what you must do is soak the stuck area with lukewarm water until the bedding is damp enough to pull free with no effort. If this means that you need to drag your duvet into the shower with you to pull it free them so-be-it. This tactic should also be applied if any other types of material/clothing might become stuck to a tattooed area. As already mentioned, the number one rule if you have one or many scabs that have formed heavily is to not pick or scratch at the scab. Although the bigger and badder the scab, the more inviting they are to pick off, thicker scabs will normally do a lot more damage to your tattoo than smaller ones if they are pulled away prematurely, so resist the urge. Also, the bigger the scab the easier it will be to catch on clothing and other objects, so you’re going to have to be extra cautious when putting on/removing clothing and doing general day-to-day tasks etc. When you have a shower, try as best as possible to keep the scabbed area from water contact. The more water that lands on the tattoo, the more water the scab is going to soak up, making it more prone to catching on things until it completely dries. Be very careful when cleaning and drying the tattoo, especially when going over the scabbed area. When drying, VERY gently pat the area dry and continue to check that the scab doesn’t stick the paper towel as you pat. If the tattoo scab is dry and cracking, apply a small amount of moisturizer in order to rehydrate the area. Don’t apply too much though, and make sure there’s no water/other moisture on the area before adding the lotion. If any moisture is trapped between the skin and the layer of lotion, the scab will soak up the moisture and go sticky/soggy. Please note that it will take at least a month or two for your tattoo to return to its full clarity and sharpness after getting a new tattoo. Even though are scabs may have peeled and flaked off, your tattoo will still generally sit underneath a layer or two of dead skin. It’s not until this dead skins flakes away that you will see the true color and sharpness return back to your tattoo. However, if you are concerned that your tattoo may have lost some ink during the scabbing process, you may wish to return to your artist for his opinion/reassurance. Sometimes, as with any type of scab, the scabs forming over your tattoo can accidentally be pulled off or get caught on another object/piece of clothing, which may cause the scab to bleed. The bleeding in itself means that the scab was probably set quite deep into the skin at the point of being pulled off, meaning that depending how big the damaged area was, there is a chance of ink being lost in the process. You won’t have much of an idea of how badly your tattoo was damaged until the whole scab has dropped off and the healing has completed, but once you are able to see the full extent of the damage, and you can see that there are some patchy areas, you should go to your artist to enquire about a touch-up. Of course, just because you tattoo scab has been bleeding doesn’t mean that any damage has definitely been done to your tattoo – there is a big change that your tattoo will likely still turn out absolutely fine. You have probably reached this article in a quest to make sure that the scabbing on your tattoo is normal and that there is nothing wrong with it - and you should now hopefully be aware that, apart from a couple of uncommon circumstances, tattoo scabs are most-definitely completely normal! Do not worry about the scabs on your tattoo as long as they are mainly light and small (with the odd big ugly one thrown in). Just make sure you follow the tips and suggestions advised above, and in good time the scabs will drop off naturally leaving a much clearer, sharper tattoo shining through from underneath.